Door stickers are a great way to liven up toned-down interiors and showcase colorful accessories. Our collection includes various motives and patterns starting from picturesque nature landscapes, through urban panoramic views, ending with flowery designs and patterns with cartoon characters for children. This is why you'll easily be able to find interior door stickers suitable for the style of your space. These wall decorations will instantly embellish a wooden or glass door leaf, while at the same time refreshing the decor and highlighting the chosen color palette. 3D stickers, on the other hand, may be used in the hallway to visually enlarge its small space and give it a more lively character. The images of entrancing landscapes can be introduced into your interiors not only as paintings, but also as decorative stickers for any kind of surface. Nothing stops you from decorating your hallway, living room, or bedroom with a door sticker depicting your favorite forest, mountain, or sea scenery. Landscapes allow you to highlight the overall style of your space. They make it more expressive and colorful. Historic tenement houses and charming alleyways are just a few from among many compelling designs which will send your home all the way to the artistic districts of the most dazzling of cities. Front door stickers illustrating the Eiffel Tower will look gorgeous in bright, elegant interiors, ornamented with glass accessories, chic patterns, and mellow decorations. The motive also comes in a retro black-and-white or pastel color scheme, as well as in sepia. The stickers will therefore match any interior perfectly. Your space will gain a unique atmosphere and its arrangement will be greatly highlighted. For instance, a flowery meadow door sticker will automatically warm up the style at your place. Interior door stickers are an incredible way to decorate a door leaf in modernist room. Our designs include multiple patterns inspired by geometry and painterly abstraction. These decorative graphics liven up minimalist interiors and make toned-down spaces more expressive. 3D stickers depicting geometrical shapes work best in modern living rooms, as they put modern design in the spotlight. For those of you who enjoy more subtle motives, we recommend graphics with flowers. A front door sticker illustrating the white orchid is a functional decoration for bright interiors with snow-white walls and subtle ornaments. The flower adds grace to the interior. Red poppies, on the other hand, will be most effective on doors in rustic, traditionally arranged rooms. They emphasize the beauty of wooden furniture, wicker baskets, and floral motives. 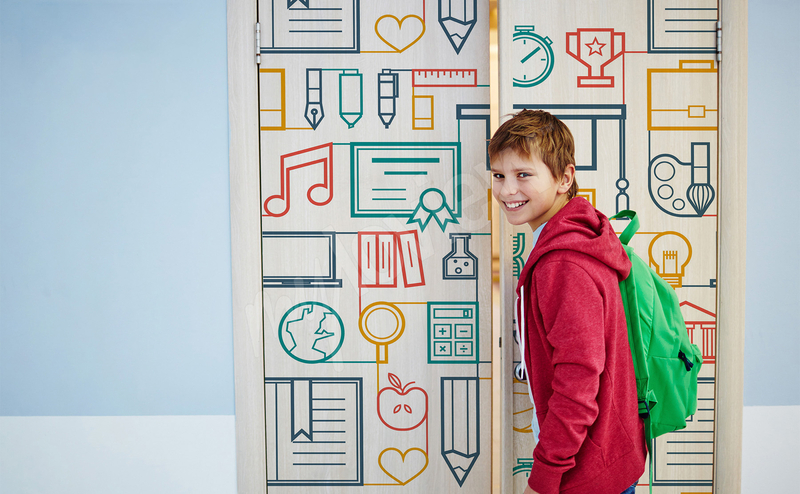 Sliding door stickers with cartoon-inspired designs will add some magic to any child's bedroom. They can bring the charm of Disney movies straight into the room. Our online store offer includes a collection of glass door stickers. These stylish designs make any glass surface infinitely more appealing. You can also use one of our ornamental designs to decorate your shower cabin. The stickers will make any public space more attractive and bring a breath of fresh air to minimalist offices. Floral patterns will add some nature-inspired beauty while colorful motives inspired by stained glass will provide some artistic vibe and passion. Such ornamental compositions may be used to decorate a balcony door too. Door stickers also add some unique atmosphere to the bedroom, blending in with elegant accessories, light-colored furniture, and sheer fabrics. What motives are ideal for doors? As you now realize, the choice is vast. Just remember to make sure that the pattern of the sticker matches all the other decorations in a room. For office doors, choose abstract, designer projects which will play along with the seriousness of the space. Neutral designs are ideal for living rooms. To decorate glass doors, however, colorful stickers depicting stained glass compositions will serve their purpose perfectly. Which option will you decide on?